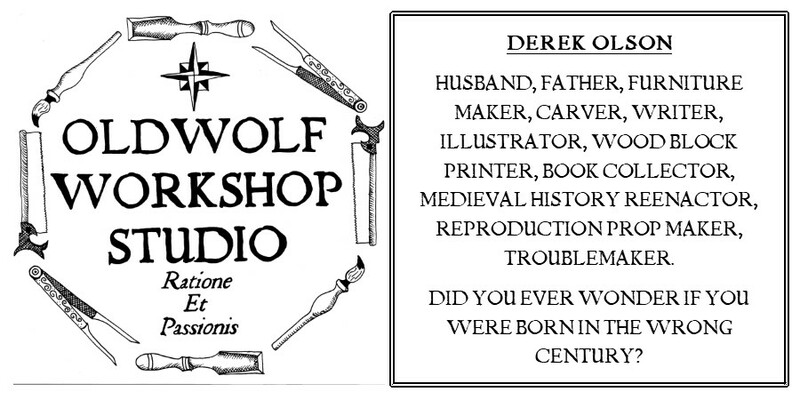 I here by declare the new incarnation of the Oldwolf Workshop open for sawdust! One more good say is all it took. 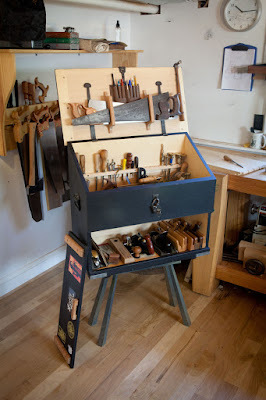 There are still a few smaller projects to get accomplished but at this moment in time all of the workbenches and tools, both hand tools and power tools, are set up and ready for action. Well I may be overstating one big and one more minor omission, but we'll get to that. First as a reminder on where we were, I had the workbench side of the shop nearly done, but one the other wall of the shop I had a disaster brewing, Here's a reminder pic of the traffic wreck that was over there. I put a couple of days of work into it and by this late afternoon I had it polished up and looking a bit more respectable. I even managed to hang a rack for my longer clamps. Here's a couple shots of how the whole place looks now. On to the glaring omissions, the biggest is my table saw, I love her but she is a whole day of set up, tuning, and adjusting by herself. Besides the biggest issue I have at this shop is adequate power supply, I will be amending that issue soon, but for now it's just not there. I have to work to remember not to run several different devices at once, and any bog on the motors flatlines the power. I know that my table saw is the biggest electron consumer in the shop. Its the only thing I have ever consistently blown circuit breakers with. I have made the decision to not assemble her until the time is right. She can live under her tarp and out of the way for quite a while, and almost a year ago that would have broken my heart. I wouldn't know how to do woodworking without a table saw. After living in the hand tool monastery that was the previous incarnation, the Wood Shop Jr, somehow I'm not so broken up over the decision. The other item that is going to be sitting and waiting for a while is the 1940's joiner I picked up this spring. I have a lot of work to do on that one with removing the rust and making sure the motor works. I have too much on my plate to tackle that yet until maybe this fall. Who knows, maybe even next spring. Now I have to focus on breaking down some rough cut white oak into the necessary pieces for an upcoming "secret" project. Secret here on the blog anyhow as its intended for someone who know about this blog and reads it from time to time. I will show some pictures of the process and what I'm working on, but I won't be showing any finished product until the baby is in the hands of its future owner. I will also continue work on the Moxon twin screw vise as a filler project while glues dry and what not with the main "secret" project.